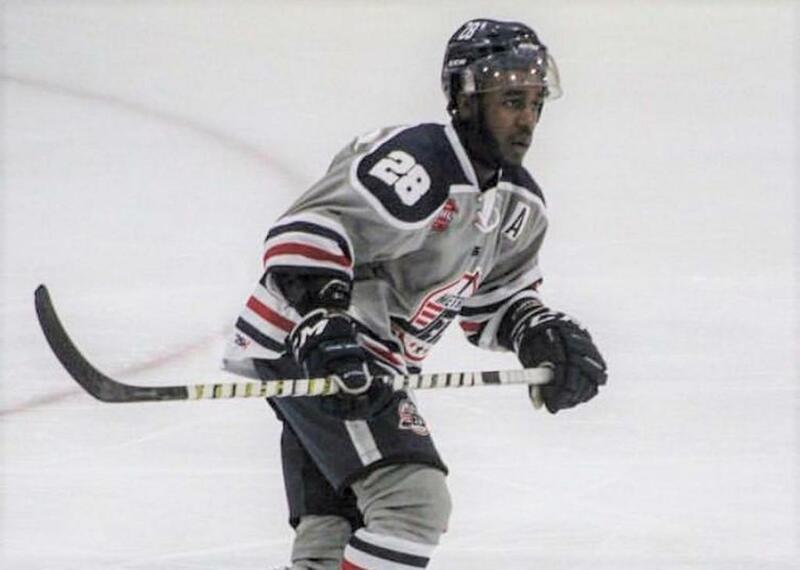 FRASER, Mich. – The NCAA commitments keep coming for the Metro Jets. Just days after defenseman Devlin Macaulay committed to play Division III hockey at New England College, Jets forward Jhuwon Davis announced he’ll be joining Macaulay at the Henniker, N.H., school in the New England Hockey Conference. Davis, a 20-year-old Southgate native, is elated at making the decision to continue his hockey and academic career. In addition to Macaulay, former Jets forward Connor Inger and goaltender Andrew Kormos also play for the Pilgrims. “It is going to be great knowing those guys are going there, and to have Inger and Kormos already having a year in the books, they can give Mac and I some pointers about next year,” said Davis. “Going in as a freshman, I’m going in with the right mindset and to work hard and let the rest take care of itself. I’m just very excited. Last season, Davis etched himself into Jets history when he scored the overtime winner as the Jets clinched the national championship. He recorded 18 goals and 45 points in 2017-18 and then added 15 goals and 46 points in 2018-19 as the Jets again played in the national championship game. Jets coach-GM Justin Quenneville said Davis will be missed at Fraser Hockeyland but knows the opportunity to play NCAA hockey is a dream come true for Davis. Davis added that his two seasons with the Jets were a major benefit to his development, both on and off the ice. “Playing with the Jets was an honor and was a huge reason why I am where I am today,” said Davis. “I’d like to thank ‘Q’ for everything he’s done for me over the past years. Same with (Jets associate head coach) Jamie Lovell for all the workouts over the summer and (Jets assistant coach) Randy Wilson with his goalie skates throughout the year. They were always there when I needed them, so I’d like to thank them. In reflecting on donning Jets colors during his junior hockey career, Davis noted that it was more than wins and losses.